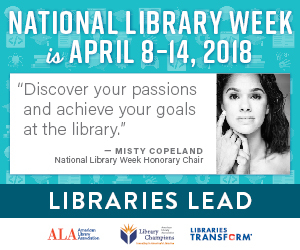 National Library Week (April 8-14) has the theme of Libraries Lead. What does this theme mean, when even leadership scholars have a hard time defining leadership (de Haan, 2016, pp. 506-507)? De Haan and Kasozi describe leadership as “a process that is devoted to enhancing an organization’s effectiveness” (as cited in de Haan, 2016, p. 508). Libraries understand processes. We librarians understand our workflow processes, as well as the processes of creating and sharing information (Association of College & Research Libraries, 2016, Information Creation as a Process section). We communicate those processes to you, so that you can find the information you need and use it. Most of all we understand the communities we serve. We are here to help you as individuals and you as a university to achieve your goals. We strive to keep improving this service.